Curated by Deborah Klochko, executive director and chief curator of MOPA, the exhibition segments Bank of America’s Art in Our Communities, a photographic expose designed to inspire audiences worldwide. The program, established in 2009, offers museums and nonprofit galleries public and free exhibitions. More than 130 showings have been displayed since the onset of this unique program. “Moment in Time: A Collection of Photographs” literally took years to come to life. In 1967, Beaumont and Nancy Newhall were hired by Samuel William Sax, president of the Exchange National Bank of Chicago, to assemble America’s first historic photographic exhibition. At the time, investing in fine art was common for banking institutions. Sax, a seasoned photographic collector, was convinced that photography was fine art and “worthy of collecting.” Work was amassed from the Museum of Modern Art, The George Eastman House and the Art Institute of Chicago. 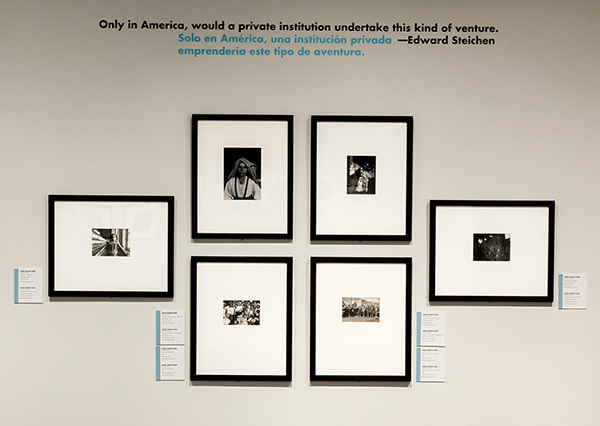 Bank of America, current owners of the collection, approached San Diego’s MOPA to exhibit an assortment of the celebrated compilation. San Diego embraced the idea with open arms. Trailblazing photography icons, dating back to the 1800s, reign among the works on display. “‘A Moment in Time: A Collection of Photographs’ is not only a fabulous exhibition for MOPA — the collection represents the greatest hits of the best-known photographers and their iconic images,” said Klochko. The exhibition is divided into three sections. “History” opens the door to understanding “what goes on in photography.” William Henry Fox Talbot, credited as one of the inventors of photography, dates photos from 1843. Julie Margaret Cameron, one of America’s first female photographers, is featured along with Lewis Wickes Hine’s immigrants entering Ellis Island and child laborers in Chicago and Pennsylvania. Timothy Sullivan’s photographs of the West give way to Edward Steichen’s New York portraits. “Chicago” follows suit, sharing the exemplar as well as the eclectic. Aaron Siskind, Arthur Siegel, Harry Callahan and Art Sinsabaugh are also among the legends. “A Collection of Photographs” finalizes the breathtaking, historical assortment, scanning the likes of Ansel Adams and Helen Levitt’s New York circa 1945. Beaumont Newhall’s work stretches between 1946 and 1970. Elliot Porter adds modern color as Man Ray exercises abstracts in black and white. Pirkle Jones highlights San Francisco while Edward Weston covers the 1920s and ’30s. Sporting a master’s of fine arts in photography from the SUNY, Buffalo, New York, and a “strong background in museum education,” Klochko described her 12-year tenure at MOPA as the perfect role. Klochko noted that MOPA is “pay-what-you-wish admission. “Anyone can engage in the exhibition whether or not you choose to pay,” she said. Accredited by the American Alliance of Museums, MOPA addresses cultural, historical and social subjects through its photographic exhibitions and educational programs. San Diego’s MOPA houses historical and contemporary photographic works and photojournalism materials and documents related to the medium’s history. The Edmund L. & Nancy K. Dubois Library, located in MOPA, showcases more than 20,000 photographic artifacts including 8,500 photographs from over 700 artists as well as monographs, magazines, encyclopedias, and exhibition catalogs. The exhibition is funded by Bank of America, the city of San Diego, the Gardner Bilingual Fund, and the Massey Charitable Trust. “Moment in Time: A Collection of Photographs” runs through Sept. 23. A coffee table book of the presentation is also available. — Luci Viti can be reached at luciaviti@roadrunner.com.